The publisher's ruse worked perfectly. But they do have a few books, mostly those dreaded bestseller piles. It's a common moment in my frequent-flyer life. The usual recourse is to seek a new-to-me book by a familiar name. 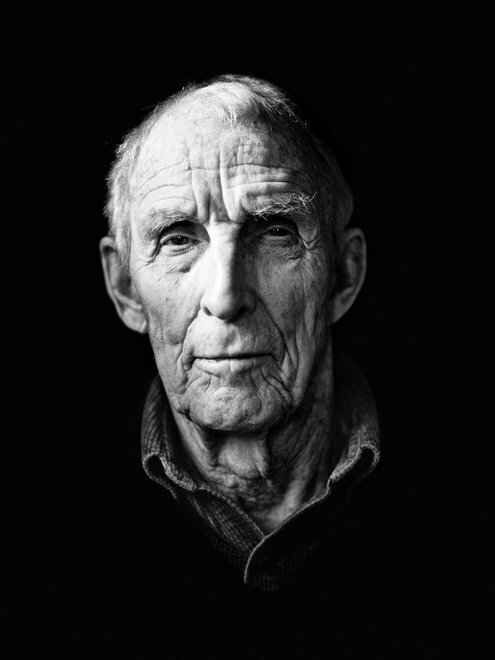 There it is: between management gurus and Fifty Shades sequels, a book by Peter Matthiessen, celebrated travel writer, novelist, Zen practitioner, and by all accounts a beautiful human being, who passed away last year. It's called In Paradise. Airports are made of impatience, so I want to know what I'm getting. Front cover: a railroad track dividing into three and vanishing into blue haze. "Poetic and scarifying," says the Washington Post on the cover, which tells me nothing. I flip to the back cover for the usual two paragraphs of semi-informative summary, only to be fixed in the author's gaze: Damon Winter's stunning photo of the elderly Matthiessen, filling the whole cover. He looks right at me as the great spiritual teachers often do: compassionate in our shared awareness that I have nowhere to hide. No plot summary anywhere on the book. So I open the book to a random page and see the word "Auschwitz." And here I think: I do not want to spend a four-hour flight at Auschwitz, but no worries. One of the world's greatest and wisest voyagers, Mathiessen might drop into Auschwitz somewhere in a book. But he wouldn't write a whole book set in Auschwitz. I trust Mathiessen on this. In an airport second, as Netanyahu's baritone scatters the appeasers back to their dark holes, I actually think these things. I buy the book, settle on the plane. In Paradise is about a meditation retreat at Auschwitz. Except for a few scenes in Cracow at the beginning and end, we are all trapped there together. At my pace the book takes four hours, and explodes them into eternities. Twenty or so people have gathered at Auschwitz for a week in mid-winter, 51 years after the camp's liberation. (How few plots there are! This is the setup of countless mystery stories, comedies, and reality TV shows: a bunch of contrasting strangers stranded together in the creaking, storm-wracked hilltop mansion, or a tropical island.) There are five or six real characters, all unforgettable: a young German man whose life is consumed by his nation's guilt, a young Catholic novice just beginning to learn about the Church's role, a brittle but kindly female professor from Israel, an easy-going soft-voiced retreat leader who seems fresh off the plane from Esalen, and a mysterious angry knot of a man, Earwig, who is rude to everyone and yet is never thrown out. There's also a protagonist, of course. The other participants are little herds of nationality, lurching together. There's a clutch of middle aged middle class Germans over here. Over there is a chorus of Israeli Jews studded with the requisite Palestinian, and over here are "the Poles," who seem to do everything in unison, though most of what we see them do is sit with their arms crossed, saying nothing. Lodging in rooms where the SS once slept, eating simple meals reminiscent of what was served to the doomed, these people's days will be filled with tours, meditation sittings, and "bearing witness." Meditation is the death of narrative, so we see it only from the outside: circles of figures cloaked against the cold, first in the main hall, then on the train platform, then in the half-ruined crematorium. The witnessing scenes, by contrast, are the abyss over which the the novel swings, lowering us slowly. With his charges seated in a circle, the Zen leader allows each to speak. He facilitates but does not suppress, calm as the trapped scream of their guilt or rage, lacerating one another. And in this space, all of it is true. There is a plot: a protagonist, a love interest, an oppressive authority, an uncovering of truth, characters broken and others remade. But as the characters themselves keep noting, plot is an artifice here, if not an obscenity. I found myself irritated as the journey of the Catholic novice Catherine, discovering her church's role in this place, went flat as she became a love interest, fleeing a masculine gaze. But all the plots go flat here. The book seems ready to devour itself. No, I didn't want to spend four hours at Auschwitz, nor did any of these characters really want to spend a week, but they did and so did I, aware that even to breathe in this place, let alone form thoughts and feelings about it, can be called wrong, puny, disrespectful, pathetic. It can even be called appeasement, I think, imagining Netanyahu's stone-disapproving gaze. I certainly didn't want someone as credible as Matthiessen to end his fifty-year career with the idea that tribalism is not something from which civilization will emerge, but rather the barest reality of what human beings are. All this screaming and wailing, you call this a meditation retreat? But the end of meditation is not serenity. The end is truth, and the truth is that this is Paradise. Sam Harris's Waking Up: An atheist's guide to the limits of "atheism"
Sam Harris’s Waking Up: A Guide to Spirituality without Religion presents itself as a guide to meditation for the skeptical atheist, one that can separate the practice and insights of meditation from the quasi-religious claims that often accompany how it is taught in the west. The book builds on Harris’s intellectual atheism (laid out in more detail in The End of Faith) and integrates it with his years of experience with meditation, including intensive retreats of many months duration. Anyone seeking spiritual clarity from an atheist or agonistic starting point will find it a beautiful and challenging read. On my second pass through, Waking Up, I've finally come to enjoy it as an intellectual thriller: How far can an atheist go in describing the immense and permanent mystery of consciousness while still defending the rigid markers of his atheism -- notably his insistence on disparaging the category (never well defined) of "New Age"? Rain in Seattle. Sun in Los Angeles. Fog in San Francisco. Wind in Chicago. The endless summer nights of Helsinki or Edinburgh. How could we navigate without our stereotypes of the urban air and sky? In his odd novel Voyage to Pagany, the great modernist poet (but not novelist) William Carlos Williams tells of a self-absorbed man riding through Europe by train. In Chapter XIV (adequate fragments here) he's delayed in the middle of the night in Genoa. I will never see the sun in Genoa. But here's what's odd. When I read this chapter in graduate school, the only experience I'd ever had of Genoa was of passing through it at night on the train. In fact, that remains my only experience of Genoa, so that even now, when someone says "Genoa" I imagine a city at night. Northwest Italy isn't high on my list of travel destinations, so it's quite likely that I too will never see the sun in Genoa, and hence never dissociate the city from this absurdly accidental recollection. Professional thinkers-about-cities would never reduce their impression of a city to a story of something that happened to them there. But everyone else does this quite naturally; when I ask a person on the street what she thinks of a city, she'll often mention some joyous or traumatic recollection, presenting that as her permanent definition of the place. We urbanists are supposed to take pride in having a larger, grander view. But I bet most of us carry these silly but useful attitudes, at least when we get fairly far down our personal list of Cities We Want to Think About. Right now, you see, I don't feel a need to expand my awareness of Genoa, except to the extent that I want to expand my awareness generally. I wouldn't pass up an expense-paid visit to Genoa in the daytime, and would surrender my prejudice happily if I did. But failing that, the prejudice is working for me. It's painting a relatively unfamiliar part of Europe with a few touchstones of mood. Thanks to these quick associations, my near-total ignorance of northwest Italy, while still near-total, is packaged and marked with a couple of personal baggage tags, so I can haul it around as a familiar without having to look inside. The baggage tags are personal, but they're also authorized by the Greater Truth of Literature. Anyone can pass through a city at night, but I passed through Genoa at night just as William Carlos Williams's hero did decades ago. I have a similar tag stuck on Bologna, where I once had a scare of thinking I had missed a late night train connection and would be spending the night on a station bench. I'd have forgotten the episode by now had Robert Dessaix's hero not had exactly the same experience, in his fine novel Night Letters. Nonfiction lies all the time, but fiction makes no truth claims and therefore can never be disproven, so it can sell itself as "Access to Deeper Truth" even when it's just the whining of a man stuck in a train station. Williams and Dessaix tell me that I wasn't alone in my nocturnal and unwanted visits to Genoa and Bologna, that these experiences actually Resonate with the Human Experience. So I remember them. Thus authorized, it feels good, at least to me, to permanently associate cities with atmospheric conditions and their related moods. Even dealing with cities I know well (Seattle, San Francisco, Los Angeles) I find a pleasure in wrapping each in the stereotypical weather condition (rain, fog, sun, respectively) and experiencing all variations from that as an engaging nuance. For cities I don't know it's even easier: for me it's always night in Genoa. These simplifications are silly but useful in maintaining a firm structure on which more interesting thoughts can sometimes sprout. Now and then I notice myself consciously choosing a new atmospheric prejudice. I was in Chicago over Memorial Day weekend 2011, and would like to declare that hereafter, I shall consider Chicago a city where towers loom in ominous chilly fog and thunderstorms. On my stay there I had two days of that, followed by two days of hot sun. The fog and storms, I decided, are the Chicago I want, because they allowed me to experience the downtown skyscrapers as overpowering, exactly as they were intended. Structures vanishing into the clouds are not just tall, but unknowably, maybe infinitely tall. Chicago was built to turn a vast frontier into commodities and profit. The dramatic starburst of rail lines emanating from it look like force-lines of a blast, so to be at the center of the blast is, well, like the end of a science fiction film when we finally get inside the Center of Ominous Power. I wanted it to be grand but in mysterious, overpowering, intimidating way. In such a perfectly symbolic city, a photo that might otherwise be a joke, "Christ the Steakhouse," isn't funny at all. Nor can "Time" be just the name of a media corporation. Then the sun came out, and it was all flatter, more like a city anywhere in the midwest. On a long hike north from the loop, Michigan Avenue looked like Singapore's Orchard Road, Lincoln Park looked like a number of great midwestern city parks, the Clark Road business districts looked nice or not-nice in familiar ways, and the only glorious uniqueness was that my hike ended at a well-known religous site for green urbanists: Wrigley Field, a Major League Baseball Stadium with Practically No Parking. By then, it was too dark to photograph, so as I sorted photographs in an about-to-close Starbucks in what would have been the shadow of the stadium walls, I thought "this is nice, Wrigley Field at night," which is perilously close to "Wrigley Field is night." And indeed, not being much of a baseball fan, I'll be fine if I never see the sun there.